One of my embroidery goals this year is to face a challenge – to embroider something that I think will be particularly challenging. And when it comes to embroidery, I can’t think of any type that is more challenging (at least in my mind) than figure embroidery. Figure embroidery is embroidery that involves human figures. Depending on your approach, the figures can be realistic or they can be stylized or symbolic. Although figure embroidery is not limited to just ecclesiastical embroidery, it has played a significant role in ecclesiastical embroidery for a thousand years. To me, pulling off a decent piece of ecclesiastical figure embroidery is a definite challenge, and it’s something I’ve wanted to explore in-depth for a long time. I’ve decided that this is the year I’m going to explore figure embroidery. This doesn’t necessarily mean I’m going to succeed, it doesn’t necessarily mean I’m going to finish in 2015 – but I am going to explore it, test ideas, and work a project. There are many different approaches to figure embroidery, but the approach that I want to follow is the one of realism through needlepainting on a piece of ecclesiastical embroidery. I’ve toyed with ideas for the particular figure I want to work, from angels, to saints, to images of Christ or the Virgin Mary. 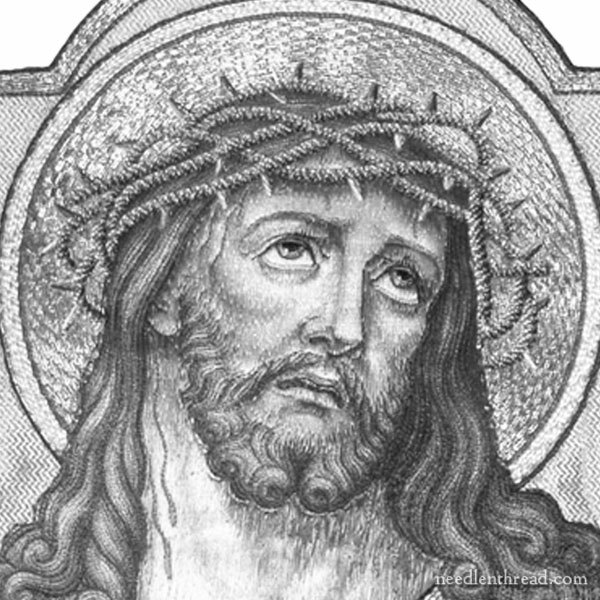 I like the idea of working an image of Christ, because there’s a lot scope there for interpreting facial expression. So far, my explorations have prompted me towards the Ecce Homo, which presents Christ usually from mid-torso or shoulders up, after He has been crowned with thorns and scourged. The scene represented in the Bible can be found in John, 19:5, when Pilate presents Christ to the crowd and says, “Behold the Man” (or “Ecce Homo” in Latin, hence the name for this depiction of Christ). The above image is of a piece of figure embroidery that was listed for auction on through Morgaine Le Fay Antique Textiles eBay store. (It’s a great shop, with some terrific treasures in it!) Lois, the shop owner, graciously granted permission for me to use her photos of the piece for my explorations. When I saw this particular piece, I was taken by the detail in the face and most especially, the eyes, nose, and mouth. Up close, some of the detail might not look so marvelous (the lips look quite odd up close), but that’s the thing about ecclesiastical embroidery – it’s supposed to be seen from far away. And in my mind, the details on this piece come across really well. 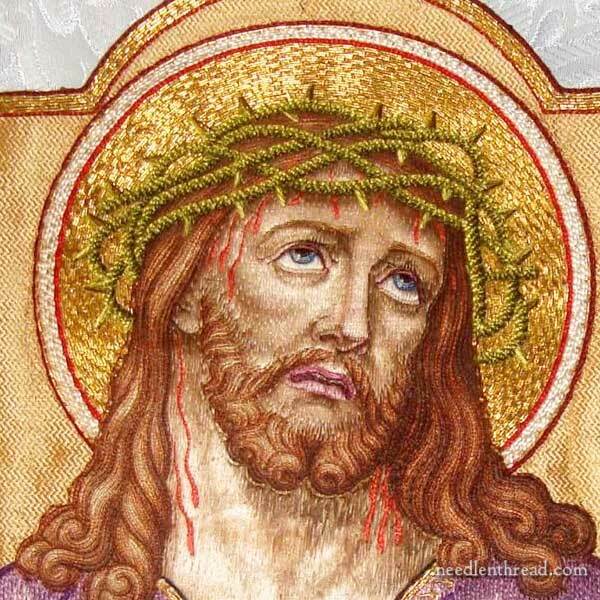 It just so happens that I also have some other patterns for the Ecce Homo figure from a very old folio of ecclesiastical embroidery patterns. I cleaned up the one above so that you can see it clearly. It comes from a larger piece that includes an elaborate design for an embroidered cross. Both of these latter designs are contenders, too. I like them for different reasons. When it comes down to it, though, I like the disposition of this piece best. Although I don’t want to slavishly copy the piece in the way it was embroidered, it is the type of embroidery I have in mind. I believe the face and neck in this particular piece, though, were painted first and then stitched over. I don’t plan to go the painting route, even though it does have some obvious advantages. When considering a piece of figure embroidery – or really any needlepainting taken from an image – it’s good to see the image in black and white. The shading becomes much more pronounced. The piece is perhaps a bit more serious than I had originally planned, when I determined to explore figure embroidery this year, but as far as a challenge goes, this definitely fits the bill! There are so many things to consider when approaching figure embroidery, not the least of which is the whole question of thread types and colors. We certainly do have an abundance of choices of embroidery threads these days, but we don’t have the same threads that were available a hundred years ago, when this piece was most likely embroidered. So testing embroidery threads and playing about with how I want to approach the embroidery once I settle on a design is all part of the process for this project. 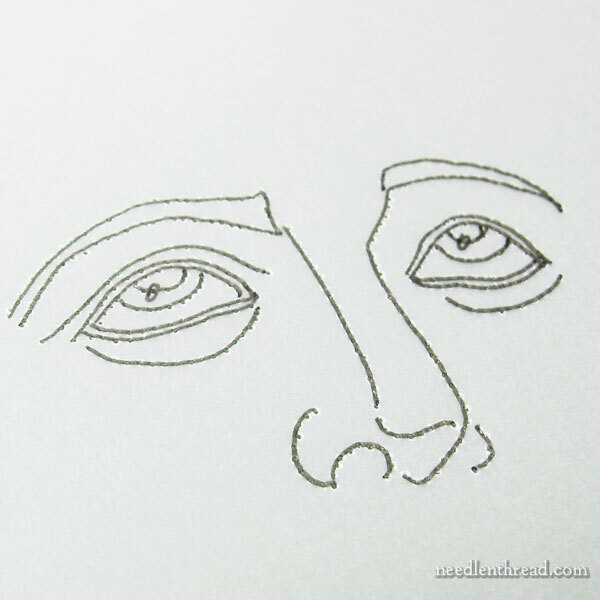 To that end, I traced some lines from the face first image above onto vellum, and I pierced them with a very fine needle (#12 crewel) mounted eye-first in my tambour hook, so that I can use this prick and pounce method of design transfer to get these lines onto fabric. I’ll be doing the trial runs for this on linen, and chances are, I’ll be doing the final project on linen, too. Which linen has yet to be seen, but as I go along, I’ll keep you updated! So, this is my Big Challenge project for this year. I’ll share updates with you, as usual, and let you know any discoveries, tips, failures and corrections along the way! And keep in mind that, even you aren’t particularly interested in ecclesiastical embroidery, it’s the methods we’re after here. The methods can be applied to other embroidery, too, whether ecclesiastical or secular. Any questions, comments, ideas, suggestions? Any preferences on the designs above? Feel free to chime in below! Just keep in mind that my own questions haven’t all been answered yet, either – this is exploratory stitching on my part, so we might have to wait for some answers! Wow! I am really excited to watch this develop!! What a wonderful challenge for you. One can never go wrong with Jesus. It will be interesting to watch you work on this project and how you get the expressions to work. Mary, This is going to be a huge challenge. But I also know that you love a challenge and do not shirk from them. Best wishes with this and will enjoy seeing your process. Wow how exciting I’m very interested in figure embroidery especially ecclesiastical figure embroidery, how exciting I can’t wait for you to start and how you will approach figure needlepointing, from what I have researched it’s a very challenging project but a very interesting challenge. 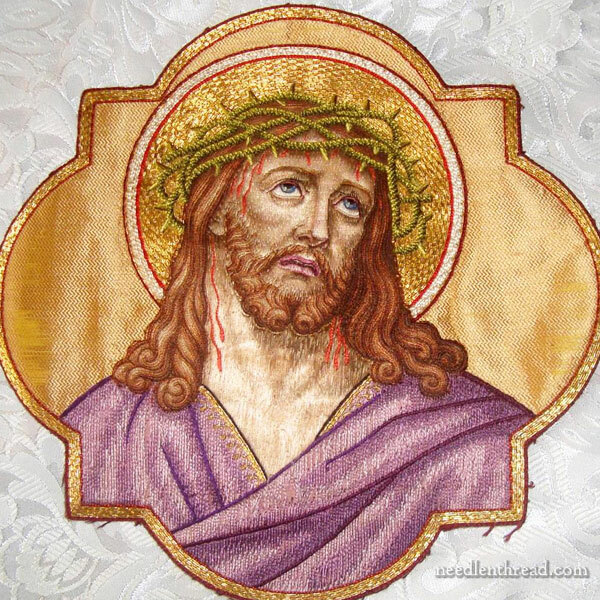 I would love to embroider the Ecco homo figure above but I’ve always had reservations because the human face is difficult to match the right thread combination. I will follow you with great interest on this and perhaps try it myself once you get started as it would be good to have your advice and instructions on this. Very exciting, thanks for sharing your news on your next project with us. This is definitely going to fill your desire to stitch something “challenging”! WOW! It is beautiful and if there is anyone that will stitch it and do it justice, I think you are just the stitcher to do that. It will be so much fun to read about and watch your decision process, stitching process and see what happens. I always learn so much from your posts. Thanks for sharing your knowledge with us – it’s really so generous of you. Thanks, too, for the post about redwork a Sun Bonnet Sue. I love her too. I’m definitely going to get that book :-). Looking forward to watching your journey down this road. I wondered if you knew that you can get tools with sharp points that make pricking anything easier? Mine comes from Pergamano, from when I dabbled in parchment craft briefly, and is essentially a pen with a sharp pointy bit where the nib would normally go. They come in various sizes (and with multiple needles for pretty patterns) and are called perforating tools. Hi, Marjan – Thanks for your comment! Oh, yes, I have a good selection of perforating tools, in various sizes. I like parchment crafts, too! The finest, though, it not as fine as a #12 crewel needle, which is what I want to use for piercing this design, since it is fairly detailed, in a small space. I’ll need the little dots of pounce powder to be very fine indeed, and as close together as possible, to make the design as clear as possible. So I use the shaft of one of my tambour hooks and just remove the tambour needle and stick a #12 crewel needle into the shaft, with the eye part inside the handle, and tighten the screw, resulting in a very nice perforating tool that is comfortable to hold and makes tiny little holes! This is going to be another fascinating project in the making – I would love to do one of Jesus with the little children or Mary. Love opening my emails to view what you are up to. Thanks for the inspiration and help. Cheers. Mary – bless your heart for taking on this challenge – you can do it! Your heart will be in every stitch, and I will surely be intrigued watching it develop, and be cheering you on. You can do this, Mary! If there is anybody that can tackle a piece like this, it’s you, Mary – The Embroidery Expert! I know one thing it will be: an “embroidery masterpiece”. Thanks, Kim! But gosh, there’s a lot of room here for disappointment, if you pin too much hope on it being a masterpiece…. I’m going forward tentatively and carefully! Mary, thank you for sharing this extremely beautiful work of embroidery art. I am Catholic and I like it a lot. I commend you for doing this and look forward to seeing how you progress with this type of embroidery, especially since it is religious. Hi, Julie – you’re definitely welcome to! I’ll be feeling my way through it over a probably-long period of time, though. I’m not considering it a pressure project, but a learning project, where I hope to make many discoveries and smooth the path for future similar endeavors, if it ends up being something that I enjoy, and that I can pull off! A few years ago I had to privilege of attending one of Aiden Hart’s icon painting courses. Every member of the class painted the classical byzantine face of Christ. I vowed I would never paint a face with a beard again!! I cannot imagine it is any easier to embroider a beard! Having said that I am so delighted you are taking up the challenge – perhaps sometime during the year you will be able to help some of us who are not quite as skilled to undertake a simpler ecclesiastical design perhaps of an angel or a saint suitable for a Church banner. I never miss reading your emails which are like ‘jewels’ among the myriad of emails which await me each day. It is a dull, damp rainy day here in Cornwall uk … we did see at least four (4) flakes of snow two days ago! Can you just say what is the size of your embroidery? Excuse my English, i’m french! Hello, Francoise! I haven’t decided on sizes yet, but I will let you know when the time comes! 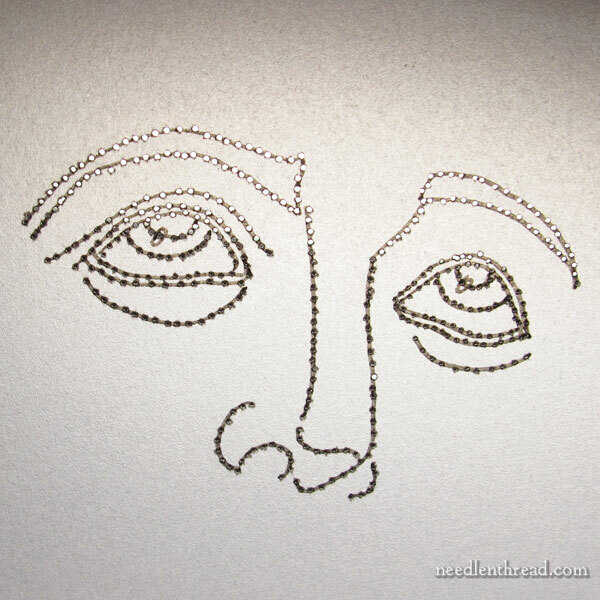 Embroidering a face will be a great challenge for you. So many approaches that can be taken. I encourage you to view the embroidered portraits of contemporary artists Cayce Zavaglia and Daniel Kornrumpf. They both are exceptional artists and do beautiful portraits with exceptional use of color and stitch. Is there any way we at home can work along with you? I would love to give this a go. I had pics of hangings done by nuns back in the 40’s and it said they used 28 colors in the face alone. As you said, it is to be seen from a distance. Up close, it shows oranges, reds, purples, browns, tans, etc. Colors I would never have imagined used together that from a distance show up as skin tone, contour, and shading. I wish you every success in this. Mary, this will be a magnifient challenge, and it fully meets the FULL definition of the word Challenge! Oh Mary, what a wonderful challenge! I look forward to seeing this project unfold. You are incredibly inspirational. Thank you for sharing your work so freely! My first thought when I read your article was “good grief she must be mad” but I do admire your spirit and believe that there is nothing that you cannot achieve. Best of luch and keep us posted please. I will wait for the start. Very interested to see your techniques unfold. I am excited to watch your progress and the learning curve that will come along with it. I did want to say that I love your blog and you have inspired me to pick up a needle and try some of these things that I love to look at. Thank you and enjoy!!!! Oh Mary, I can’t wait to see what amazing things you’ll discover. You certainly like a challenge Mary. I have learnt something already from the black and white image. I will never take on this type of project but it will be interesting and educational to watch along the way. Good luck with it and have fun too. Wow now that is a 2015 challenge. It is going to be awesome to watch this develop, I have always wanted to learn how to do figure embroidery. Well I feel like a stunned mullet after seeing such exquisite embroidery! Truly gobsmacked by the precision, skill and artistry of the piece. That would be my goal to hopefully reach in maybe 10 years time where my stitching just might be up to that standard. I too will be eagerly following your progress with this project and know I will be learning heaps from your instruction as I always do. Oddly enough I bought a roll of vellum a few days ago to use for sewing patterns – never thought of using it to trace an embroidery pattern though! Thanks for that idea and for the other great idea of using a tambour handle & crewel needle to obtain fine pricking. 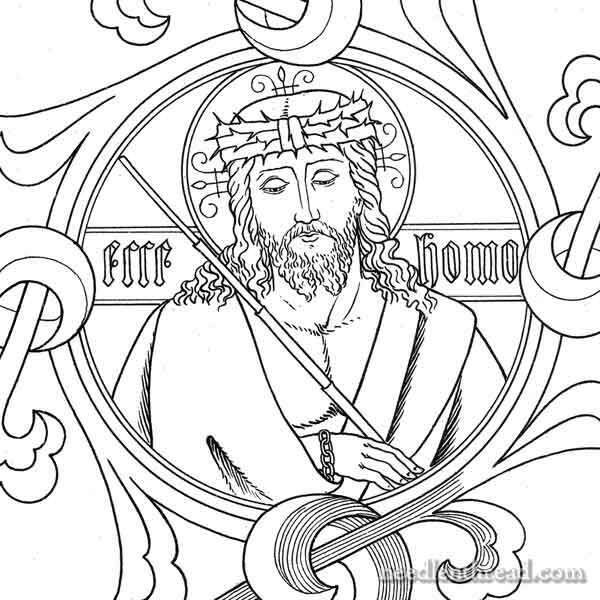 Mary, I am wondering if you are able to provide a pdf link to the two black and white patterns for the Ecce Homo figures shown above, so we can save them for future projects? Thanks again for sharing all you do with us and for the detailed nstructions/explanations you provide. Mary, this will be a major work for certain! It will be very exciting to follow your progress, and, as always, I will look forward to learning a great deal from you. I love that instead of dipping your toe into the water, you jump in needle first. I have never done needle painting except in a kit, but this would be an exciting challenge. All of my faces have ben done in applique or cross stitch or a side view of Hollie Hobbie when I was 10. (Hard to believe I have been stitching for 45 years.) Even then, I discovered that the angle of the stitches matters to get the fingers growing the right direction, the texture of the skin as it grows from the body, etc. You will enjoy the challenge, but we will learn a lot by your endeavor. Thanks for sharing it with us! What a wonderful goal for 2015! – like you, I prefer the realistic approach. The subtlety in the shading is fantastic, and looks so good when done well. As you say, it doesn’t bear very close examination, but it’s not supposed to. I shall be following your updates with great interest – one day I hope I will do something like this too. I have been working on three portraits I painted on Congress Cloth based on copyright free images of late middle ages Madonna’s and one sepia portrait by deVinci. Challenging for sure! My work is a free style rending and more abstrat than the originals. The pieces are about 1/2 finished It is exciting to see your design and read your procedure for transferring the image. I am really looking forward to your posts and truly appreciate this opportunity to learn from you experiences. Thank you so much for sharing this with your audience. Mary, this will be a labor of Love for God. Making something beautiful for God is such an old tradition.You will be blessed on this journey. You are certainly ambitious to take on the figure embroidery this year, but I have no doubt you will do a wonderful job. 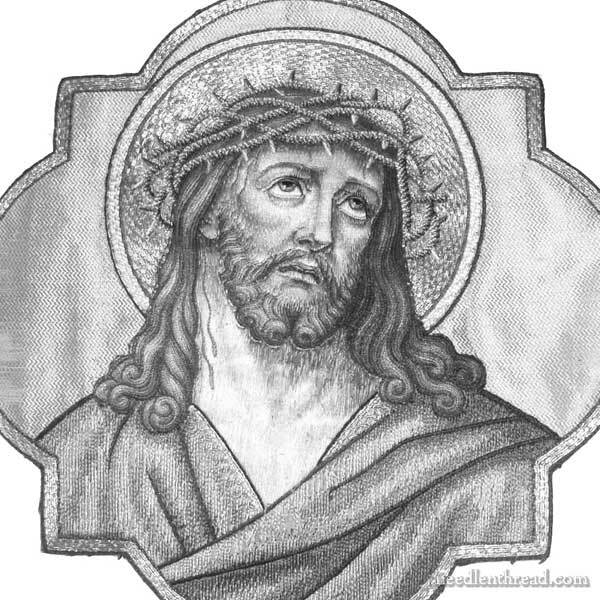 My preference though would be to depict Jesus radiating his love rather than the thorns and blood. But that’s just me. Good for you, Mary, a challenge indeed. Perhaps you should consider writing a book about the whole project from go to whoa for future generations of face-thread-painters – not necessarily in a Christian context but in a general way. There are one or two books about so-called portrait threadpainting but none is what one could call inspiring, or none I have seen. This particular image has some similarities with icons I think. I can see it as a painting with gold leafing on the shaped area behind the head. I know that you will incorporate plenty of gold, lol, and don’t ask me how I know. Realistically rendering the human face is a huge challenge in any medium. The basic drawing is challenging and I must recommend a good review of ‘Drawing From the Right Side of the Brain’ by Betty Edwards. The guidance this approach gives helps one to deal with the ‘oddness’ you think you see in the areas of the mouth that you mention in your article…good luck with this project! Sorry, but those eyes look to me like a hound dogs’ begging for a bite at the dinner table. What a challenge! That is going to present all sorts of dilemmas. Can’t wait to see how it progresses, but have no doubt that the end result will be spectacular. 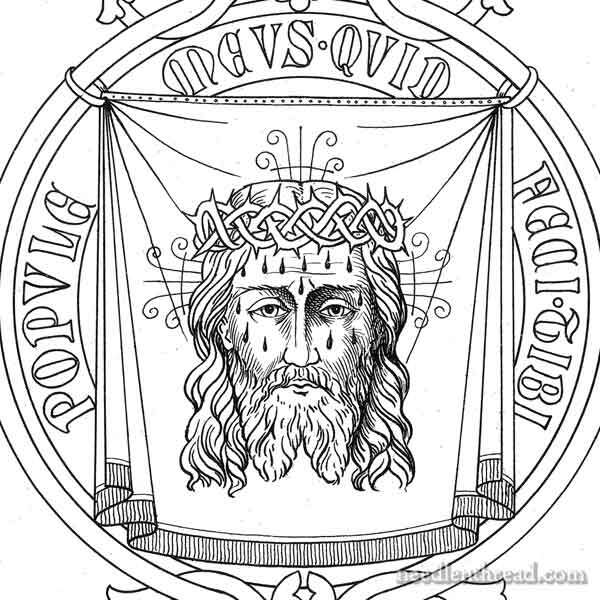 Are you using the Opus Anglicanum technique for the face, or the later, and usually quicker techniques? Beautiful! I love that you’re doing this and I will be watching with interest how you progress. Here in St. Louis we have had the impressive work of the Sisters of the Most Precious Blood who made stunning pieces of ecclesiastical embroidery and that legacy has been inherited by a group of sisters in Kansas City, MO the Benedictines of Mary, Queen of Apostles. Great to see this type of art which uses God-given talent being used to praise God in return! This is beautiful! My friend has a Sacred heart of Jesus and Immaculate Heart of Mary done by a nun in their family. They are exquisite! I have holy envy everytime I go over there! Ha! As she had them framed. There’s lots of gold, interesting stitches and multiple colors. So glad to see this inspiration and follow along! So interesting that you should be going there. When I saw Beryl Dean’s book ” Ecclesiastical Embroidery” many!! decades ago, I just went WILD with desire to stitch faces and hands in this manner. I have never lost that hunger and I was just planning to start again. I have done a number of faces in Japanese embroidery, and they are beautiful, but in a different way, but they have given me insight re: long and short stitch, shading and expression with the eyes and mouth. I am looking forward to your experiments as I now restart my own. Happy Journey! A noble exploration, but does it have to be the one with the thorns and blood? There are many more iconic images of Christ without blood. I will be watching you stitch it, to learn your color blending, etc., but will most likely stop when you have put in the blood. Firstly, I have just got to praise you for your fabulous site. I have been looking for help with faces and figures for ecclesiastical work for about 2 years and, low and behold…. you are an answer to prayer. After looking at your gold work last year, I tried my first effort on my daughter’s ordination chasuble. She now wants a cope and I am looking forward to your next update. Thank you once again for all your hard work (and especially for the information on what goes wrong)! Next Next post: Hungarian Redwork Runner … It’s… It’s….